Motorized Force Testing Machines | IMADA CO.,LTD. IMADA motorized test stands can be used as force testing machines to improve both testing repeatability and efficiency. They automatically perform force test according to the programed conditions (traveling speed, distance, etc). The capable tests are Compression test, Tension test , Peel test, COF test and more. Moreover, our motorized test stand enables to control the testing motion by force (*1) and draw a graph when connecting IMADA digital force gauge and the optional software with the applicable cables. It is ideal for efficient force tests and detailed analyses. *1 Some digital force gauges are not available. **When you need to measure Force and Displacement (Distance) at once. Standard Type Vertical Motorized Test Stand (Force Testing Machine). 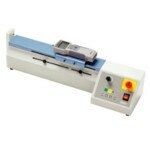 It is ideal for wide force test applications with digital setup for the testing speed, time and more. The capacity is from 500N(50kgf) to 2500N(250kgf). 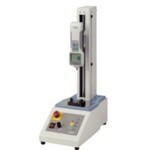 This motorized test stand (force testing machine) equips a wide range of speed 0.5~600mm/min. Stores testing motions up to 5 patterns. It is able to control the motion by traveling distance. The capacity is up to 1000N (100kgf). 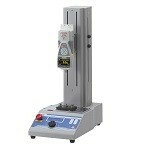 Simple Type Vertical Motorized Test Stand (Force Testing Machine). To perform simple force tests with uniform speed and angle. The capacity is from 500N (50kgf) to 5000N (500kgf). Simple Type Horizontal Motorized Test Stand (Force Testing Machine). The horizontal design is ideal for easy sample setups. To perform simple force tests. The capacity is 1000N (100kgf) . Standard Type Horizontal Motorized Test Stand (Force Testing Machine). The horizontal design is ideal for easy sample setups. 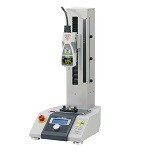 The functions are same as Vertical Motorized Test Stand MX2.The capacity is up to 2500N(250kgf).